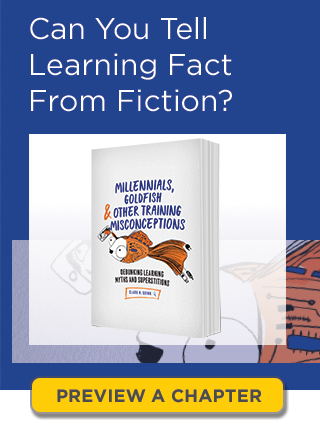 By now, you’ve likely heard that there are myths that continue to plague our industry, ranging across topics such as learning styles, Millennials, attention spans, and many more. They’re wrong, but rampant. What are we to do? First, we have to recognize that these myths are harmful. If we invest time and money designing training activities that accommodate these beliefs, we’re wasting those resources. Worse, we could actually be undermining the effectiveness of our solutions. However, changing people’s minds is not simply a matter of presenting the facts. People can be surprisingly resistant to abandoning their beliefs. In fact, if the beliefs are tied to their values, presenting contrary information can strengthen their attachment. And, if they’ve expended resources, such as having been trained or certified, or spent effort to accommodate these beliefs, they may also have a vested interest in not accepting the alternative view. Those who have a position of power—clients who are gatekeeping revenue or bosses who can arbitrarily dictate—may be unwilling to consider the situation. This presents a dilemma. How do you convince others? Yet persist we must. Not only for the reasons above, but also because the status of our field is at stake. When we follow misinformed science, we undermine our credibility. People typically don’t make strategic decisions on astrological forecasts, nor build businesses on alchemical aspirations. Similarly, we need a sound scientific basis for our decisions on creating learning. Before engaging, first we must know the science, or be forearmed with documentation. We must be prepared to present the data that debunks the myths. That’s not enough, however; we must also strategize how to present it. Research suggests several pointers. For one, we should reflect back the original viewpoint. What’s the core of this myth that makes this plausible, and how do we acknowledge it? For example, if we’re older, we see differences in young people. They do differ. We can start from there before we go on to talk about stereotyping and variation. It also helps if folks come to the new view themselves. Can you lead them to their own understanding? If we talk about brain training, can we point out that in physical exercise, the muscles we work on develop, but the ones we don’t work on don’t spontaneously develop as well. From there, we could lead people to see that the same is true of the brain, and there’s no “transfer” of growth to areas that have not been worked on. Thus, practice on certain types of activities doesn’t improve other parts of cognitive functioning; train what you need! Being specific with examples can be helpful too. Can you use a concrete example to make it tangible and real? Even a thought experiment that puts it into play can be useful. So, for brain hemispheres, you might talk about people who are both artistic and logical, and others who seem to be neither. Or, when people bring up the idea that learners have the attention span of a goldfish, ask them about playing computer games or watching movies for hours at a time. Anyone who has taught knows that learners clearly are different. What has not yet been done is to identify the differences systematically. The problem is that learners change by context, topic, mood, and so on. What’s more, trying to adapt to learners isn’t the most effective approach. Science shows that the best investment is to design for the learning outcome you need, not the learner. Here you’ve acknowledged the core of their belief, indicated where they’re off track, and pointed them in a useful direction. There are no guarantees, sadly, but you’ve respected and assisted them. You have to understand that you won’t always succeed, particularly against a financially vested interest; but with practice and effort, you stand a chance. Help them see what’s attractive and where it diverges and give them a useful alternative approach. Good learning design, after all, is what ultimately will achieve our ends. Want to learn more? Join me May 24th for my webcast to discuss my new book Millennials, Goldfish & Other Misconceptions. We’ll skewer a few of the more popular myths, and give you a basis to proceed that’s based upon research, not hype. Clark N. Quinn is the executive director of Quinnovation. He provides strategic performance technology solutions to Fortune 500, education, government, and not-for-profit organizations. He earned a PhD in applied cognitive science from the University of California, San Diego, and has led the successful design of mobile, performance support, serious games, online learning, and adaptive learning solutions. Clark is an internationally known speaker and author; his most recent title is Revolutionize Learning & Development: Performance and Information Strategy for the Information Age. He has held executive positions at Knowledge Universe Interactive Studio, Open Net, and Access CMC, and academic positions at the University of New South Wales, the University of Pittsburgh’s Learning Research and Development Center, and San Diego State University’s Center for Research in Mathematics and Science Education. He blogs at learnlets.com, tweets as @quinnovator, and works as executive director of Quinnovation. Well said, Clark. I will now be better equipped to "persuade" my industry colleagues who are financially invested in some of these myths. I'll let you know how it goes! This is wonderful Clark. I stand with you in the need to crush the myths and get the truth out there in very comprehensible ways. I was so determined to do this, that I quit my job at a director level and studied Neuroscience for nearly 3years straight. Now armed with the credentials and a world of new knowledge on how to better approach not only the myths, but my designs, coaching and facilitation methods, I am determined to spread the good word! Good for you, Lauren. Congrats, and best of luck!